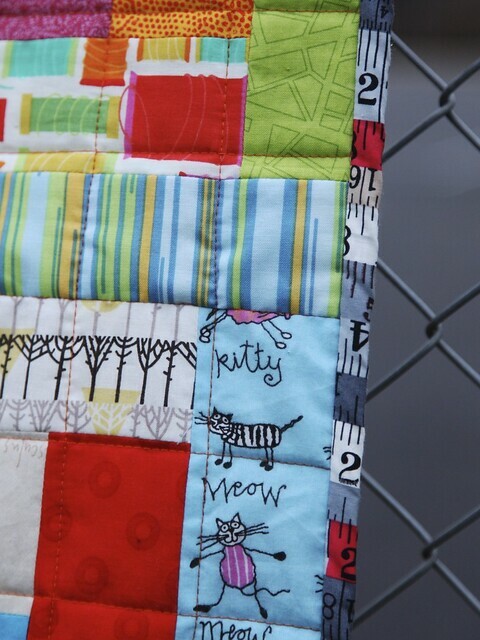 First quilt finish of 2015! At the beginning of the year as soon as the children were back at school I started the #scrappylogcabinqal. My goal for the month was to make at least 12 blocks. I was reserved in my aim as I had no idea what other ‘stuff’ the month might hold, things didn’t pan out the way I expected so I had more time on my hands and ended up making 42 blocks. Initially I planned on 12″ blocks but it soon became apparent that my scraps were generally too short and so I made 10.5 unfinished blocks. Most of the strips were 2.5″ wide some were a little narrower and then I ended up using slightly wider strips in the final few logs. I’m not a completer finisher in many things but when it comes to sewing I do like to get projects finished, so rather than abandon the blocks for a while I got right on and stitched them together. 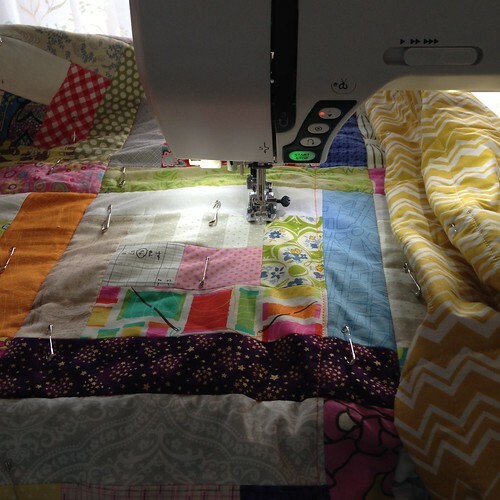 I put the quilt on my FAL list for the first quarter and as I don’t really have space to store a quilt top I got on basted, quilted and bound. 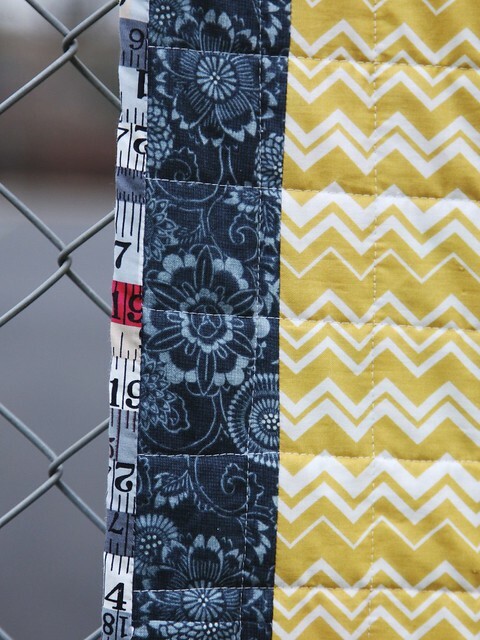 I quilted a grid of lines 2″ apart using Aurifil 2021 50 wt in the bobbin and Aurifil 2150 40 wt on top. I’ve never used 2 different weights of thread (not intentionally anyway) and it worked a treat. 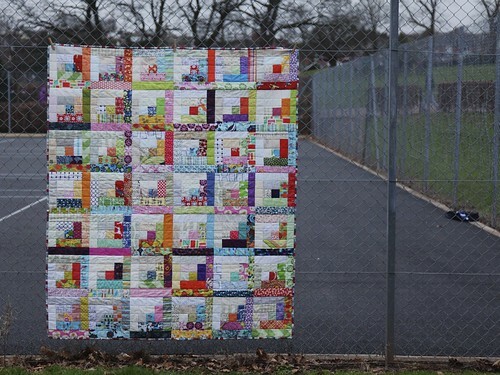 All the blocks were made from my scraps bins (which still appear just as full) but the backing and binding of this quilt were from stash. The backing I bought recently with the intention of using it on a quilt for Siblings Together, it was a bit of a bargain and I bought 3 metres of it. 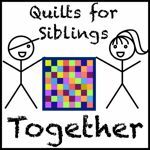 I must remember next time that 3 metres is approx 118″ and not quite enough to back a quilt that is 60″ wide! So I pieced the back and added in a strip from scrap of a dark blue fabric. It made it just wide enough! I’ve made a mental note to order 3.25m next time! I wasn’t sure how this was going to look, the only planning that went into the blocks was the positioning of low volume fabrics on one side and brights (mostly) on the other. Leah has this panda on a pair of her shorts (which she was wearing yesterday despite it being winter). The green map and stripy fabric are Barcelona from my month in the bee, it’s great to use these little left overs in more quilts! All this needs now is a wash and a label and it will be ready to go to a new home in the summer. 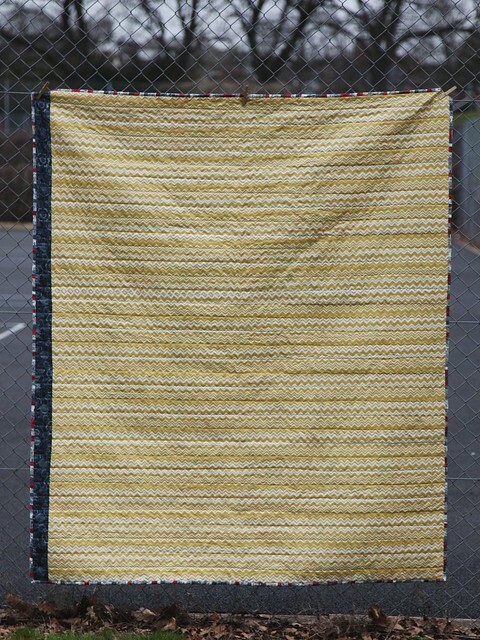 Backing – Yellow chevrons by Modern Folkloric by Henley Studios for Makower UK and a random blue strip! Thanks to Tobit for the photographs. Great job Mary!! What a brilliant finish. 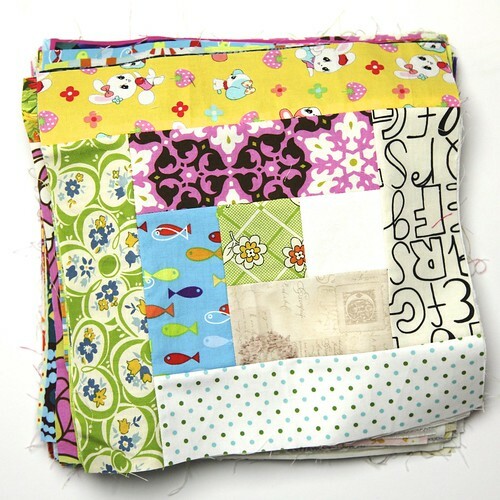 And a great way to tackle scraps. It is fabulous! I love the scrappy look and the memories. Even though it will be hard to give away because of them, some child is going to fall head over heels in love with this. Can I borrow t to take my quilt photos please? 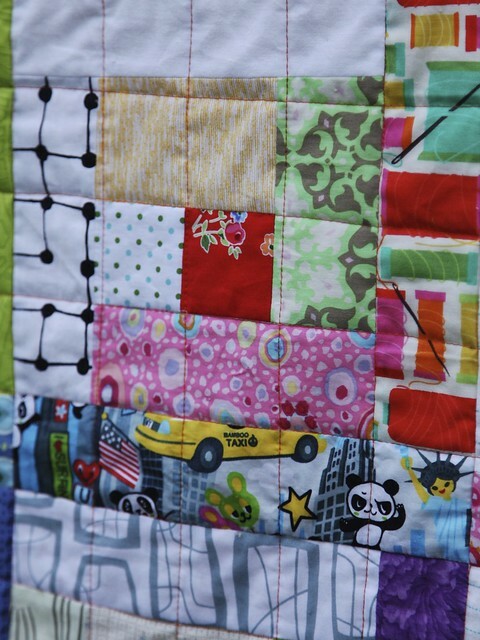 It’s definitely a beautiful quilt and one that I would have a hard time letting go of as well.